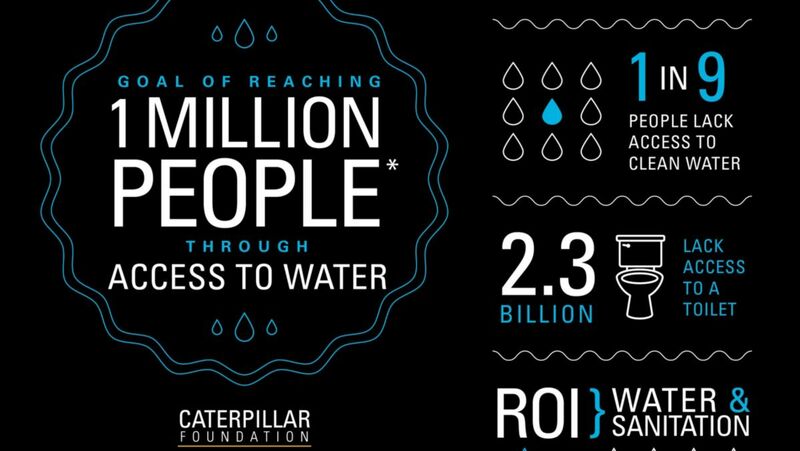 To raise awareness of the value of water and the impact of the global water crisis on community health, education and economics, the Caterpillar Foundation together with its global partners, has launched the Value of Water campaign. The Caterpillar Foundation, the philanthropic arm of Caterpillar Inc., is on a mission to empower 50 million people around the world to rise out of extreme poverty by 2020. The Foundation recognizes that water is one of the most critical basic needs of people and their communities - yet, about 844 million people, or 1 in 9, still lack access to clean and safe water. Learn more about the Value of Water awareness campaign, read stories of those directly impacted by water issues around the world and find out how to get involved. “As the company and its customers work to build traditional infrastructure, the Caterpillar Foundation is focused on building human infrastructure, and ultimately, a better world,” said Caterpillar Foundation President Michele Sullivan. “Water is a fundamental human need - it is a basic building block necessary to pursue opportunities such as education and economic growth, and place people on a path to prosperity,” she continued. and delivering running water to homes in Africa, Asia and South America through micro credits loans. The Caterpillar Foundation also invested $1.4 million with the American Red Cross to help communities prepare, respond to and recover from disasters, which includes critical needs such as providing access to safe water and sanitation. In addition to highlighting the work of the Foundation’s partners, the Value of Water campaign aims to encourage people all around the world to get involved and share via social media what they will do for water.